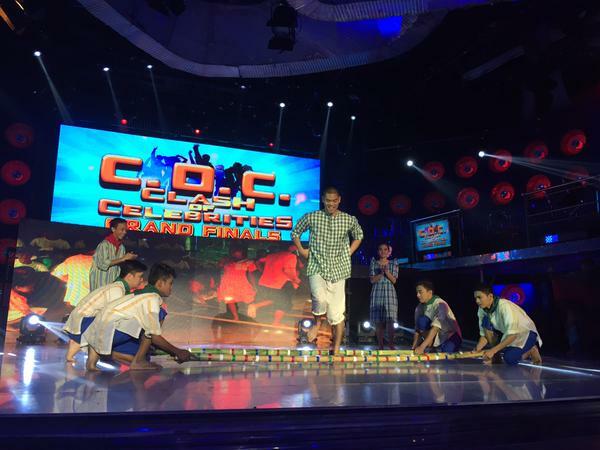 MANILA, Philippines - Singer-songwriter JayR Sillona was hailed as grand winner of It's Showtime's "Clash of Celebrities" (COC) segment in the final clash on Saturday, October 10, 2015. Jay R, a wildcard winner got 9.67 average vote from judges and has received P200,000 cash prize. The Kapuso turned Kapamilya star showcased his ethnic dance moves. Other celebrities who have competed in the grand finals include Giselle Sanchez, Sarah Lahbati and Mika dela Cruz. Giselle wowed the crowd on her 'buwis-buhay' stunt while Mika performed breathtaking cheerdance number. Rocker chic Sarah showcased her singing prowess singing Rivermaya's 'Liwanag sa Dilim' and Kitchie Nadal's Wag Na Wag Mong Sasabihin. Meanwhile, Teen Dance Princess Ella Cruz who should be part of the showdown announced on her Instagram Friday that she’ll be missing the COC due to an accident she encountered while rehearsing her stunt last Wednesday. She then thanked those who looked forward to watch her perform. Isay Alvarez, Direk Rowell Santiago and Allan Pineda served as Hurados (judge) of the said competition.